Welcome to the five groups participating in our 2018/2019 program! Registration for the 2018/2019 year is closed!. See below to see participants activities! 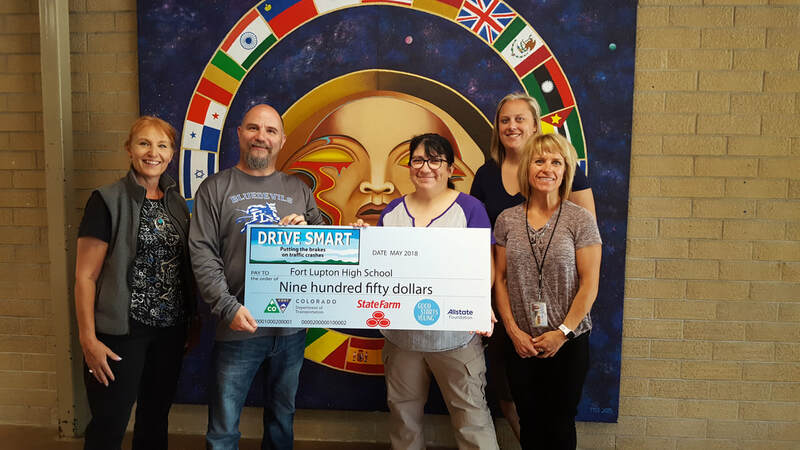 DRIVE SMART coalition members Marjorie Hanson (DSWC Outreach) and Sara Kos (Colorado Motor Carriers Association) awarded Fort Lupton High school's student council $1,000 for their participation in our Buckle Up Drive Smart program this school year! 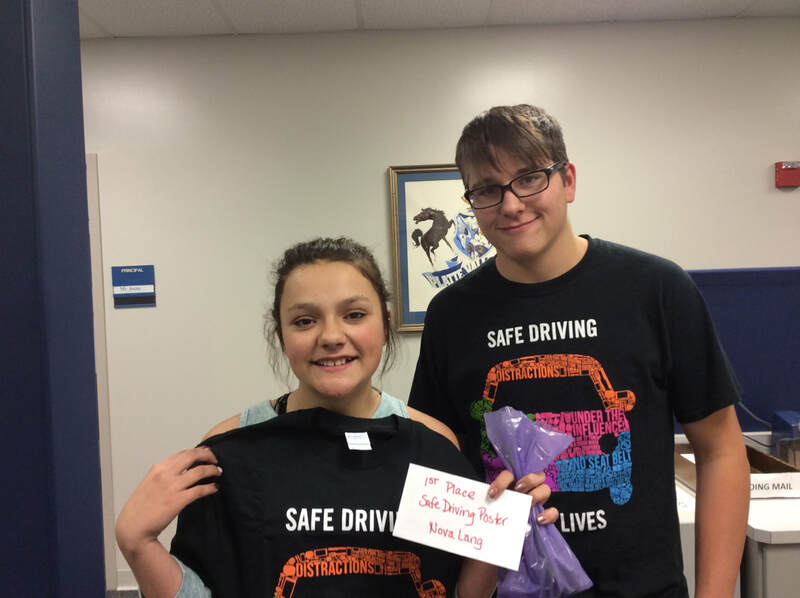 They did an awesome job of spreading the message of making wise choices behind the wheel to their peers. 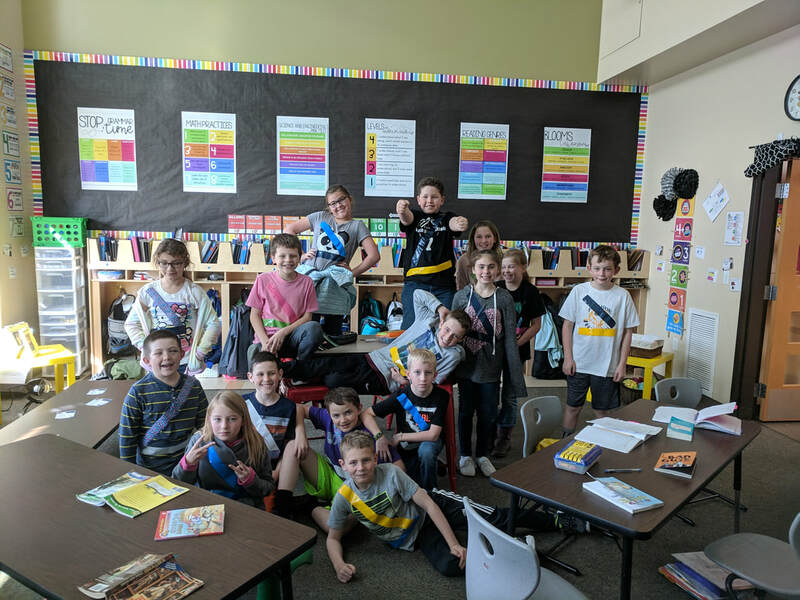 The Prairie High BUDS group gave a presentation on the importance of buckling up to kindergarten through 5th grade classes and then played a game of kahoot with the high school students to make sure everyone was reminded to buckle up and make wise choices behind the wheel. Great job! 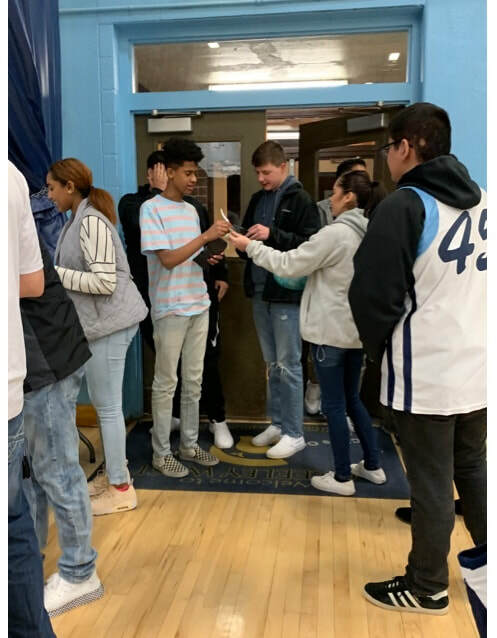 Greeley West Fashion club held a pre-prom Fashion Show where they did a skit about making wise choices behind the wheel and announcement about their work this year partnering with DRIVE SMART Weld county. The Greeley Tribune covered the event. 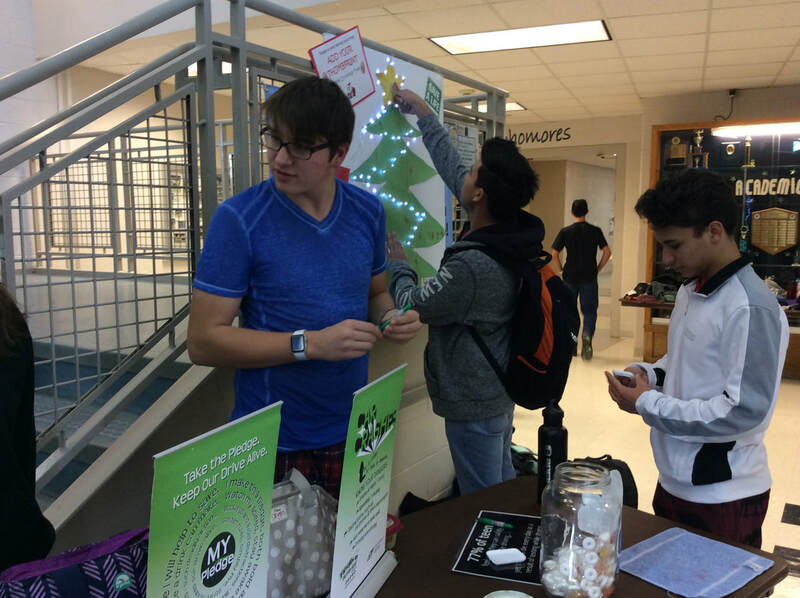 Platte Valley High FCCLA completed their final seat belt check and had seat belt safety signs that they designed installed around campus. 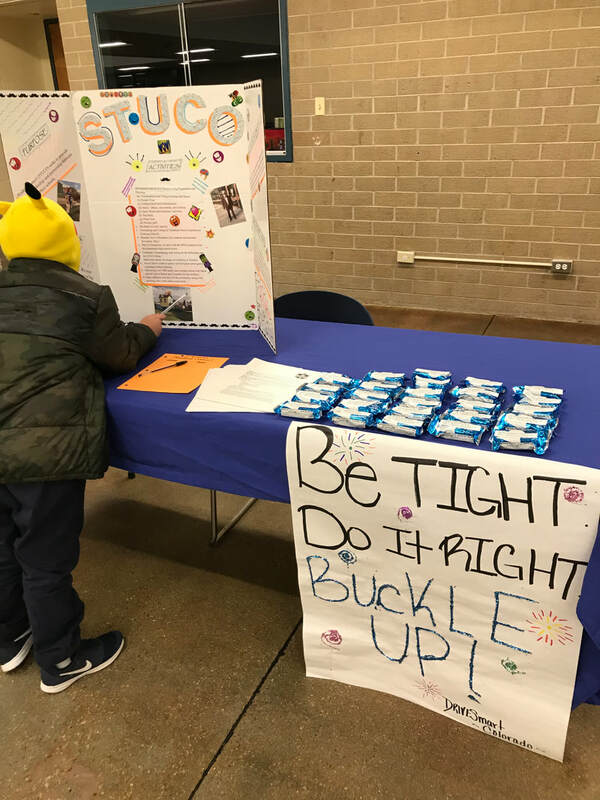 Fort Lupton STUCO had a table with a Buckle Up poster and treats with messaging for students and adults in attendance. 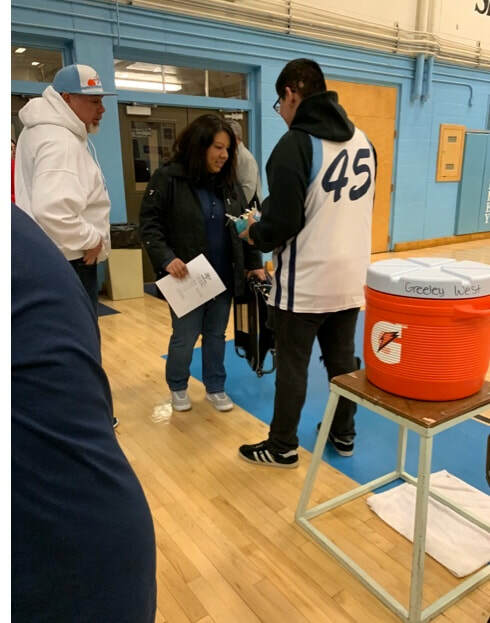 The night of the playoff basketball game, Greeley West Fashion Club handed out safety messages attached to candy to everyone who attended the game reminding everyone to drive smart. 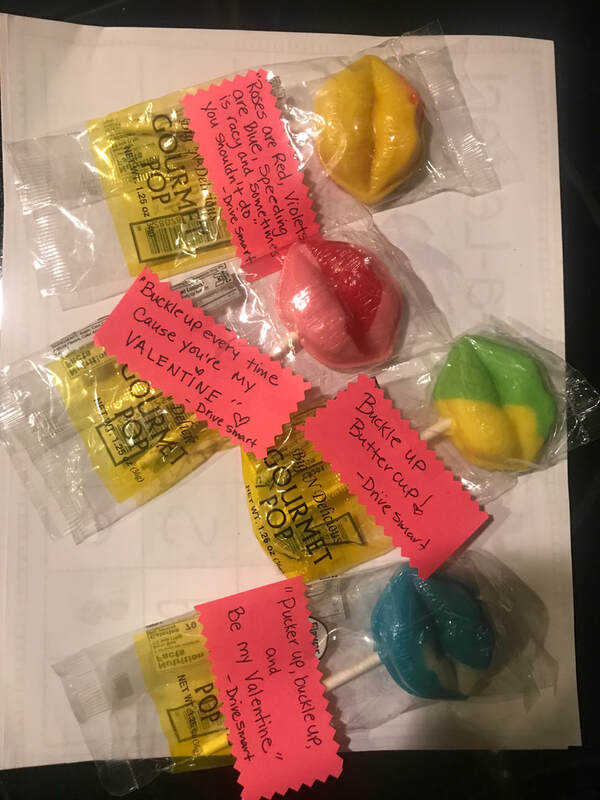 Fort Lupton STUCO had a week long fundraiser featuring Valentine candy with Safe Driving messaging. 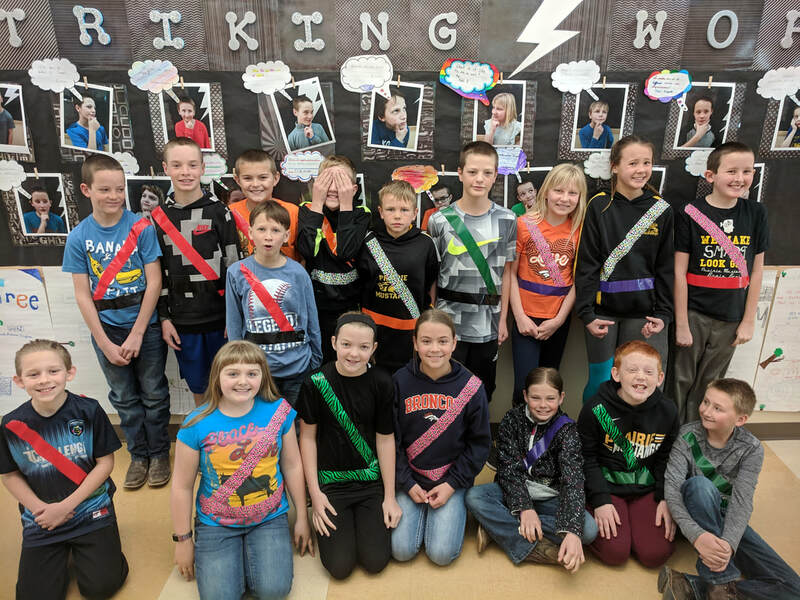 For Valentine’s Day, the Platte Valley BUDS group went to all advising rooms and took a poll of who wore their seat belts every time they drive or ride. They presented all students who answered "Yes" with a Life Saver sucker. They handed out close to 200 suckers, which is well more than half of the student body. They also reminded each class about the importance of buckling up. 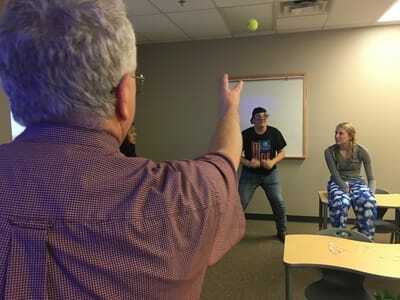 Prairie FBLA BUDS group held a workshop for members of District three FBLA to attend and work on. They gave a presentation on safe driving habits. 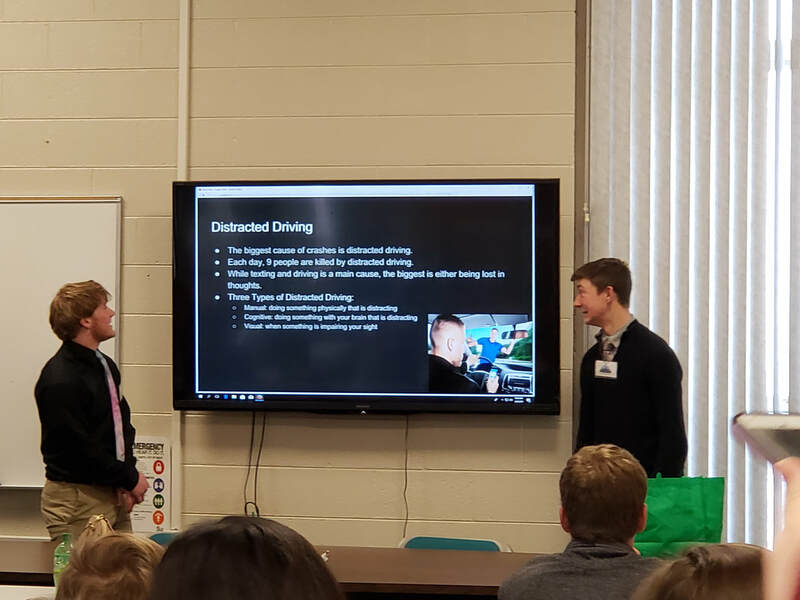 Participants used their knowledge on the benefits of safe driving from the presentation in an academic competition. Finally, they had the opportunity to see the effects of drunk driving using the fatal vision goggles. 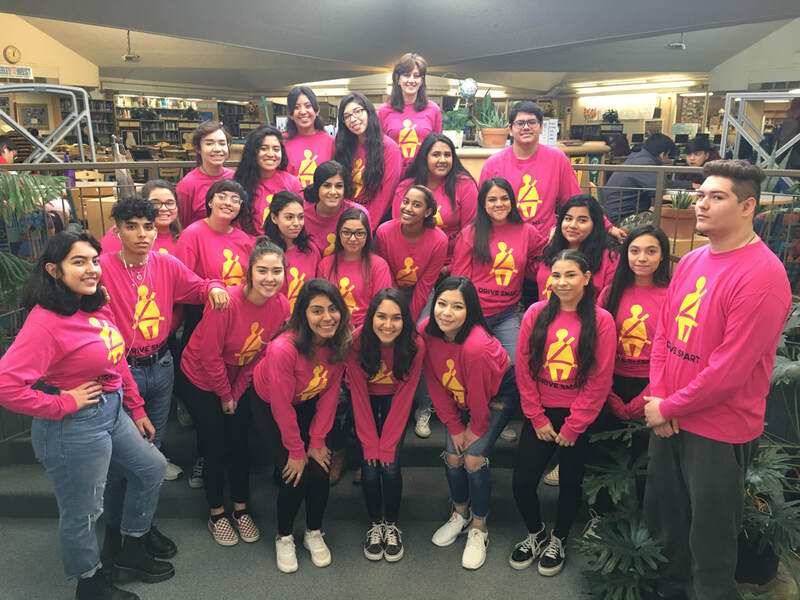 The Greeley West Fashion BUDS group shows off the Seat Belt Safety Shirt that they designed to help spread the message to their peers the importance of buckling up! 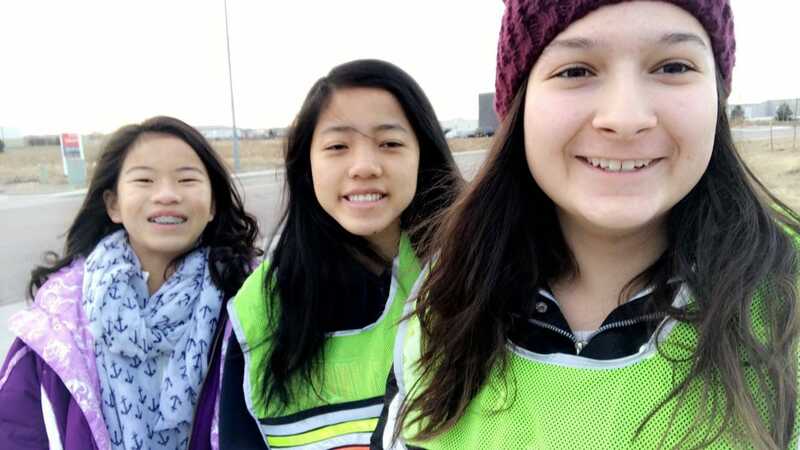 The Greeley West Fashion club team created safe driving reminders such as: "We are thankful for your life! DRIVE SMART!" and put one on each of the cars in the student lot. We are thankful for all the Fashion Club's efforts to keep other students and staff safe on our roadways! 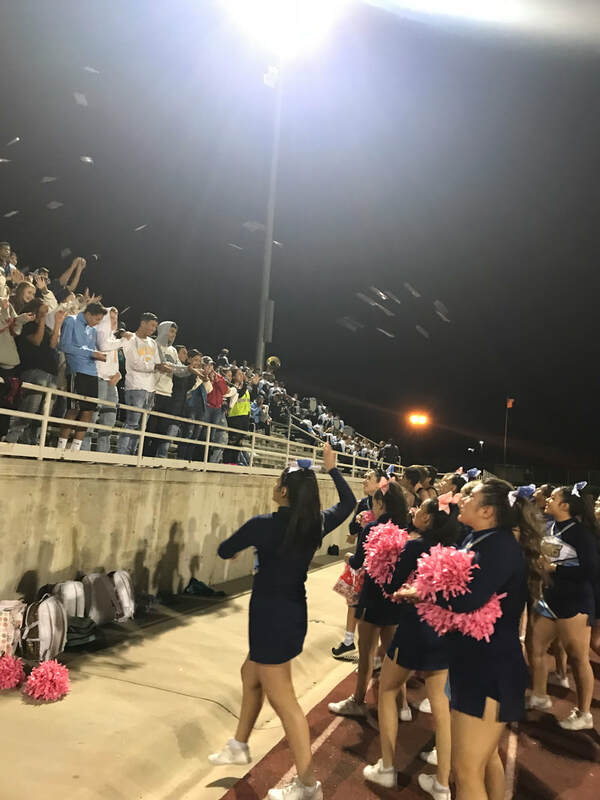 The Greeley West BUDS Fashion Club group teamed up with the cheerleaders to distribute seat belt messaging to the crowd during the game. 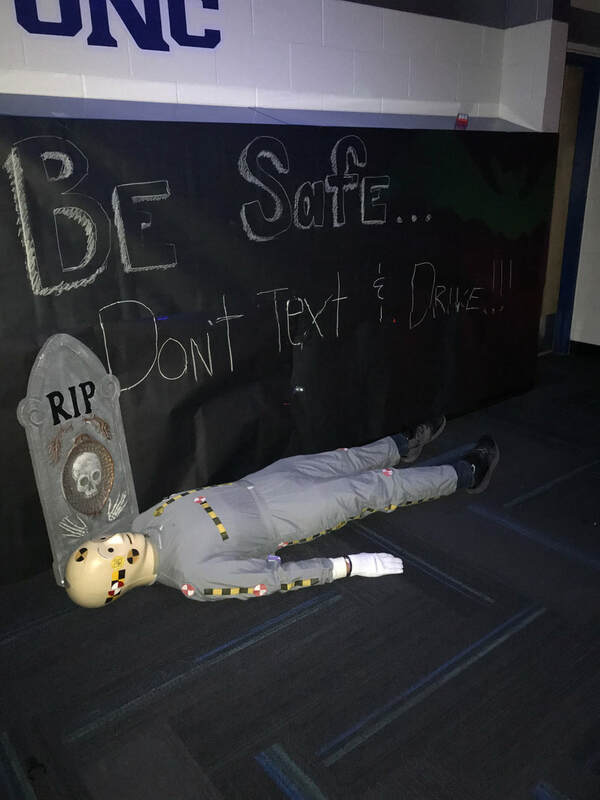 Fort Lupton Honor Society created a whole wall with safe driving messaging using one of our Crash Dummies for a community trick or treat event reaching over 1,000 people. 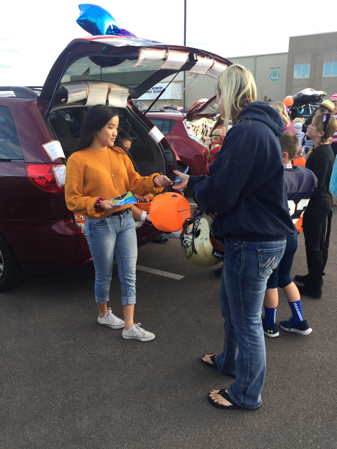 Windsor Charter Academy participated in a Trunk or Treat event. 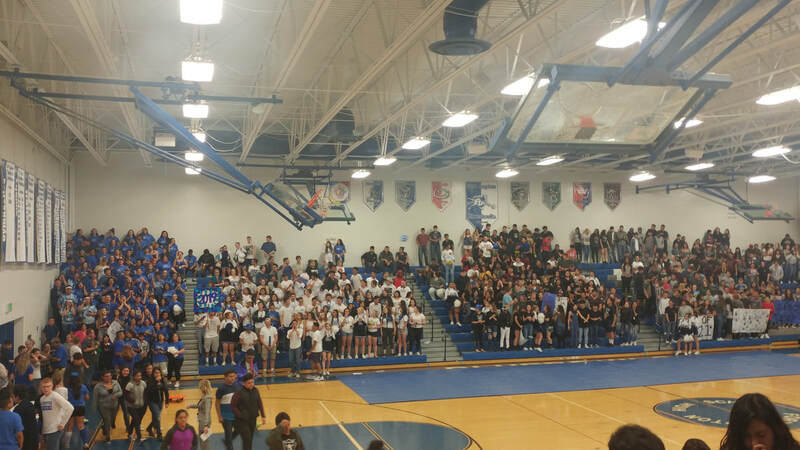 It was a great turn out of both WCA families and the public. Students were allowed to pick a question (easy, medium or hard) and answer those questions for a piece of candy. All questions were geared to Safe Driving, including putting on your seatbelt, distracted driving, etc. 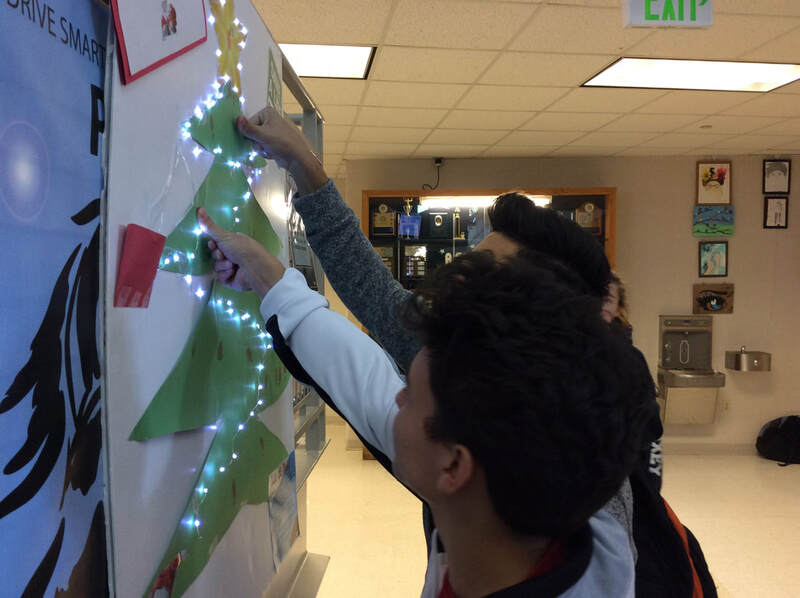 The Greeley West BUDS group created this power point that was played in all homeroom classes reaching approximately 1,700 students! 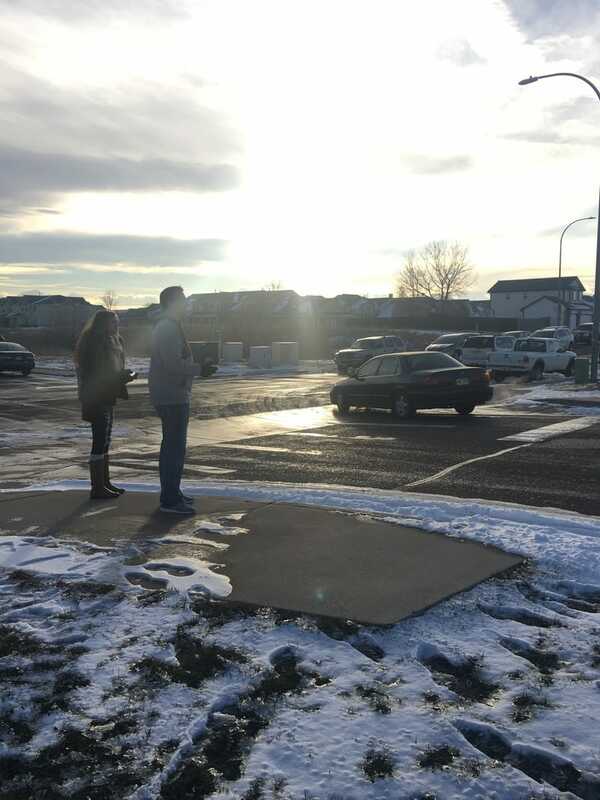 ​FBBLA students at Prairie High braved the cold to complete their first seat belt check of the year. The schools are busy completing their first school seat belt checks. This photo was taken at Windsor Charter Academy where the National Honor Society has taken on the challenge. Checks will be made three times during the school year. Students from Windsor Charter Academy take an early morning seat belt check. DRIVE SMART Weld County representatives Marjorie Hanson/DSWC, Stacey Chase/Banner Paramedics and DSWC Chairperson, Sara Kos/Colorado Motor Carriers, and Erin Olsen/WCDPHE present Fort Lupton High school assistant principal Jeff Hoff with a check for $950 for the work he and Kazin did over the school year as participants in the BUCKLE UP DRIVE SMART program. Congratualtions! 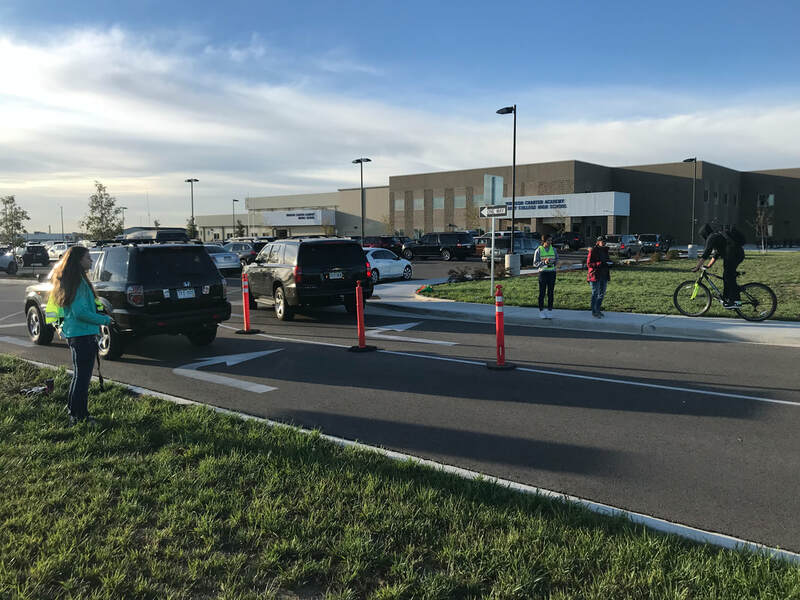 Fort Lupton High did many activities prior and during prom to remind students to drive safely on this night and every other time they get behind the wheel. *One of their teachers, Joey Taylor, spoke to students about driving safety. He was in a crash when he was 19 due to careless driving that put him into a coma for three months. He will shared his experience, and encouraged safe driving. Monday-driving while tired (After all, prom doesn't end until 3:30AM), Tuesday-distracted driving, Wednesday-safe driving tips when driving in a big city (the students will be driving to the Denver Aquarium for prom), Thursday and Friday-not driving under the influence or with someone under the influence. *Multiple fliers encouraging safe driving were posted throughout the school. *Students received incentives for making plans to ride a provided bus or get drivers. Students arrive at an all school assembly where teacher Joey Taylor talked about the importance of safe driving. 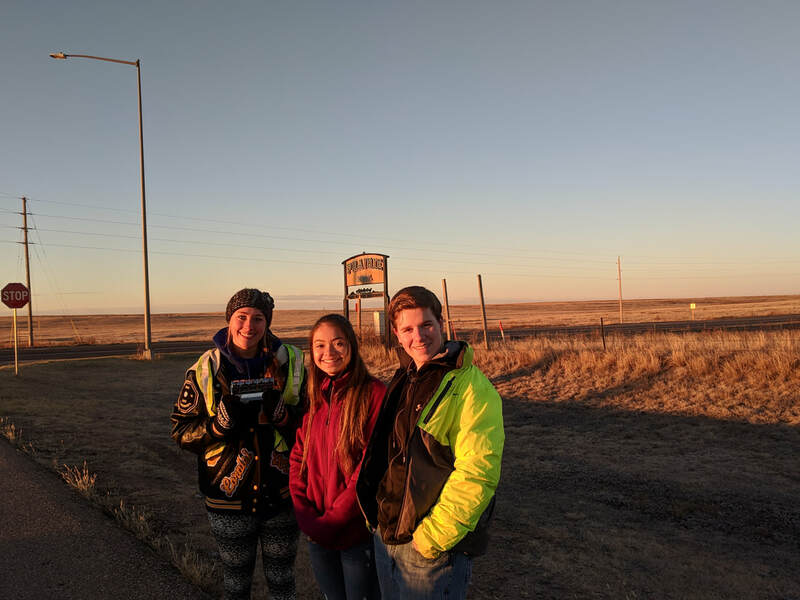 DRIVE SMART Weld County awarded Windsor Charter Academy Honor Society $600 for their involvement in the 2217/2018 Buckle Up Drive Smart program. 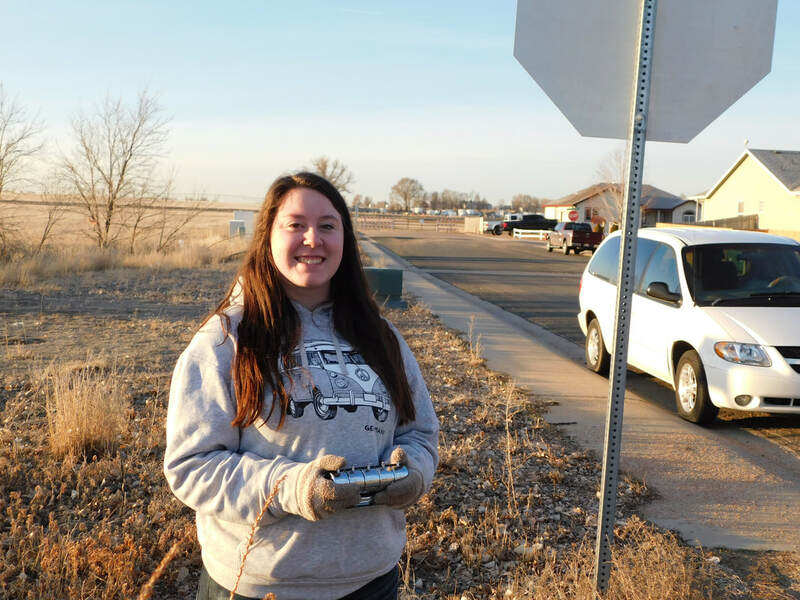 Student leader Sara Chandler headed up several activities encouraging her peers to make wise choices behind the wheel. Congratulations! 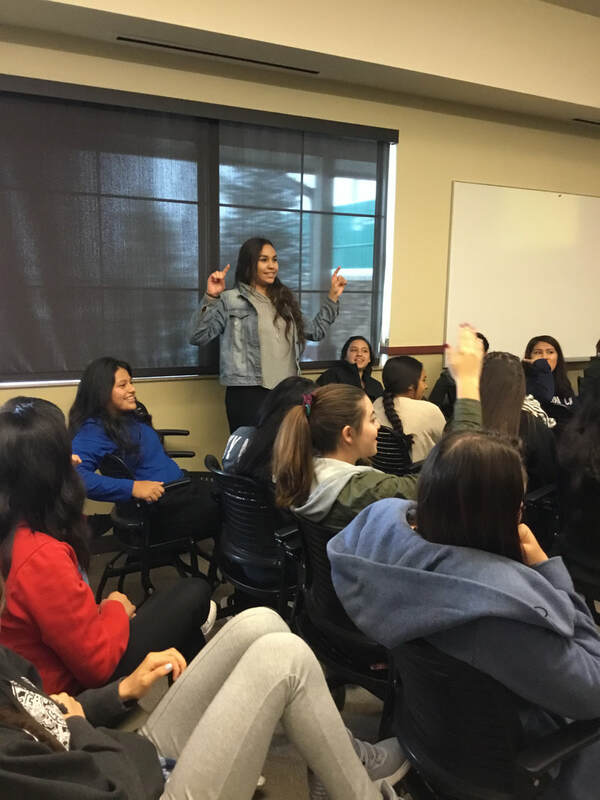 The Greeley West AVID group hosted DRIVE SMART Weld County to talk to the students about the dangers of driving impaired. 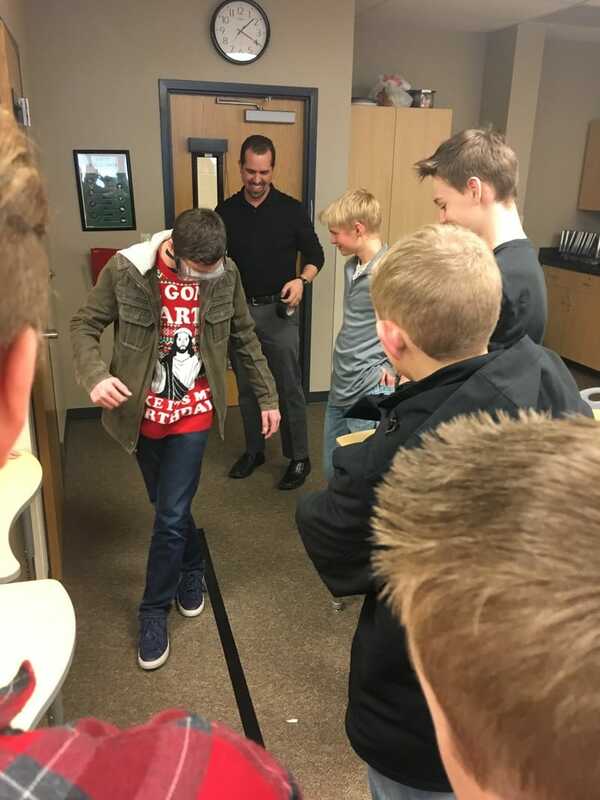 There was a classroom presentation followed by the opportunity for students to experience the fatal vision goggles. 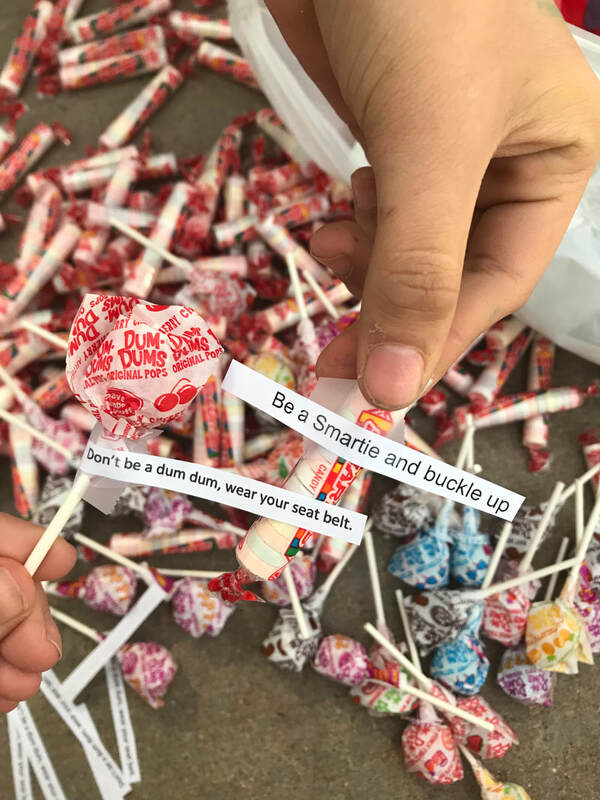 ​Windsor Charter students held a follow up activity to encourage everyone to buckle up by handing out candy smarties that said: "Be a smartie and Buckle up!" 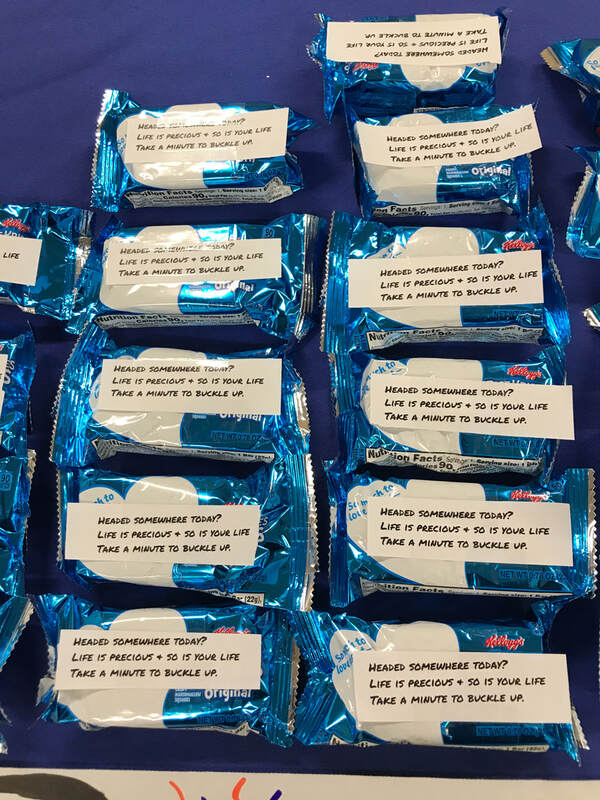 Students thought this was a "sweet" way to remind them to Buckle Up! 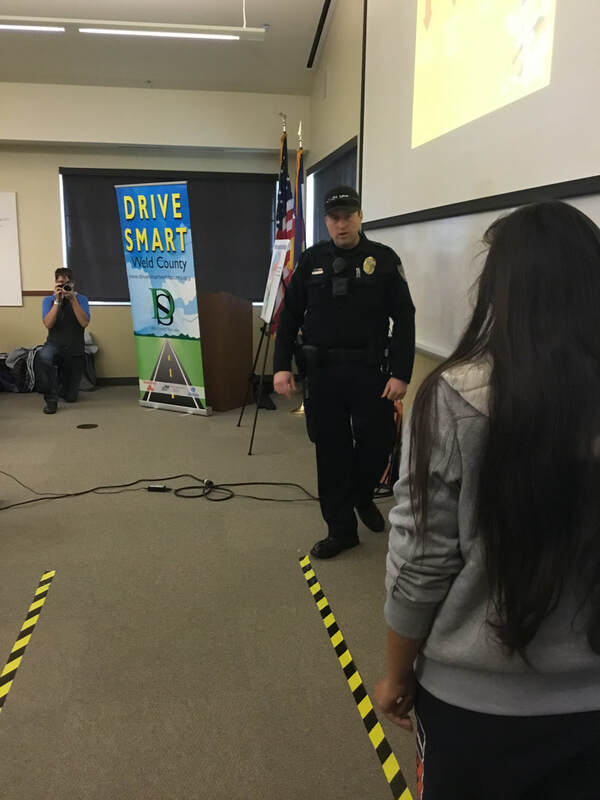 Windsor Charter Academy hosted a safe driving event for freshman that included a Law Enforcement speaker, Trauma speaker, rotations through a seat belt pledge station and crash cars. 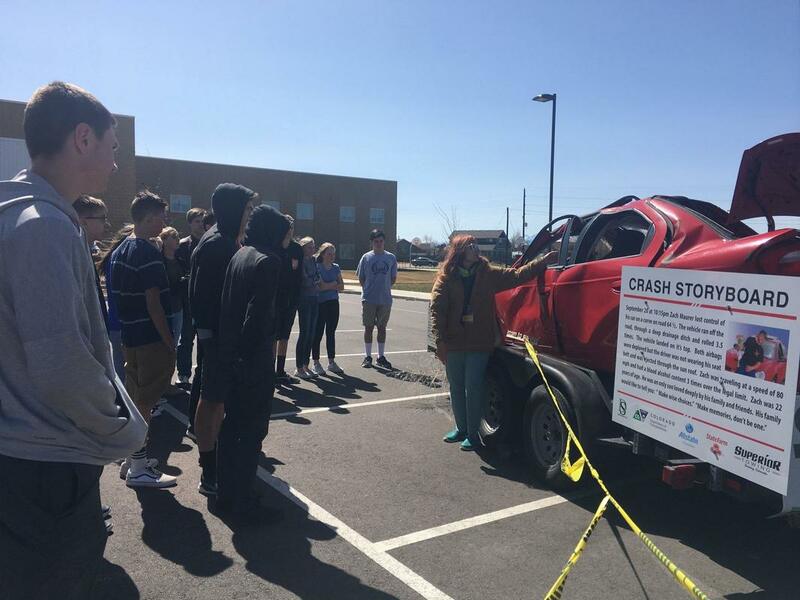 DSWC representative Marjorie Hanson talks to students at the crash cars about the importance of wearing seat belts. Senior Sara Chandler talks to fellow students about the importance of pledging to wear their seat belts. 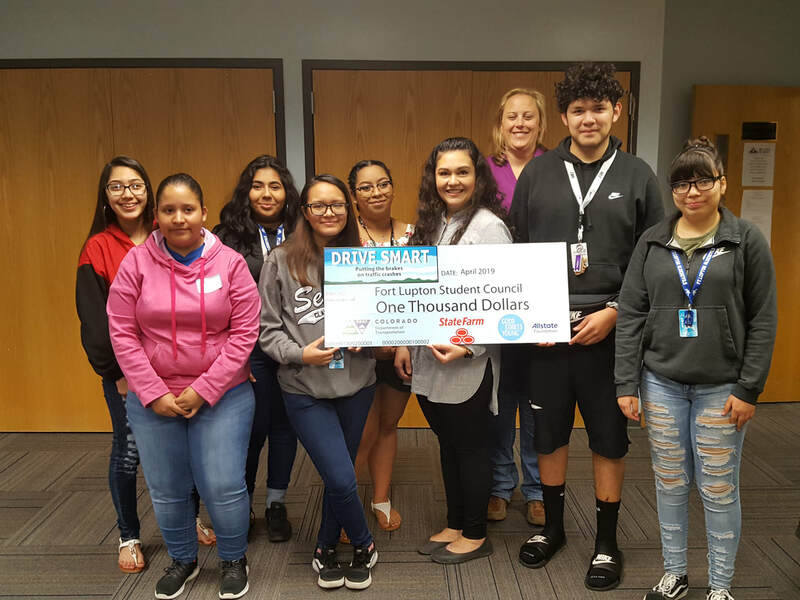 Congratulations to Platte Valley FCCLA for earning $1,000 for their BUDS activities this school year! They have had multiple safe driving campaigns throughout the year and held a Truck Smart event on the day of their award. 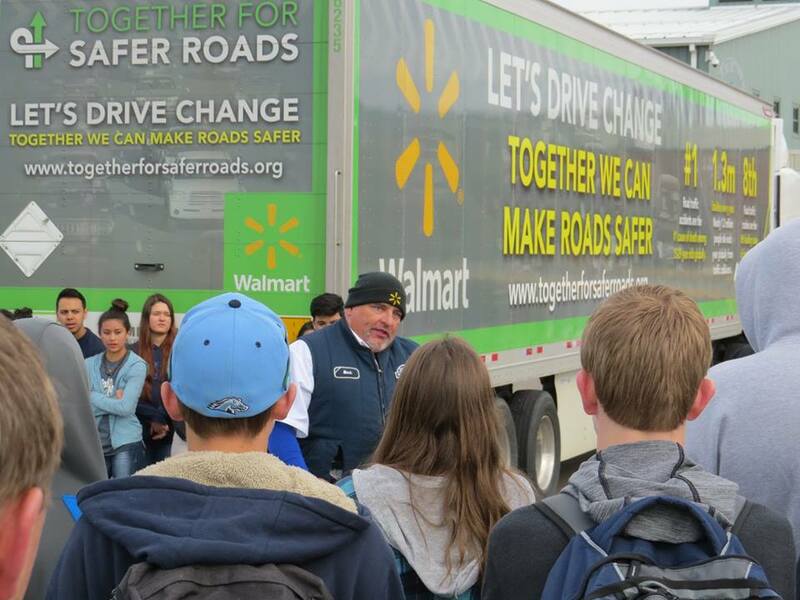 The BUDS team at Fort Lupton High School sponsored the Truck Smart program to engage students with a big rig and learn how to drive safely around them. 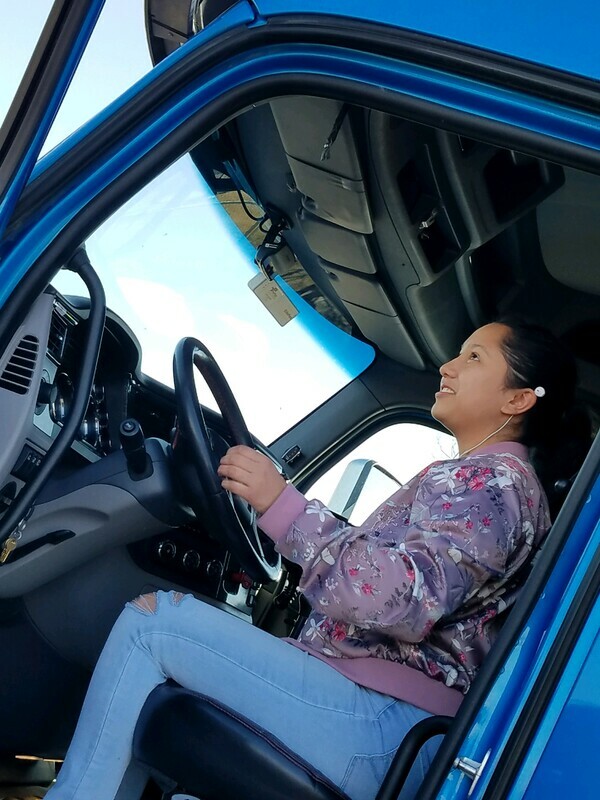 ​The Greeley West BUDS AVID group sponsored the Truck Smart program where students got to experience a big rig and it's blind spots first hand. 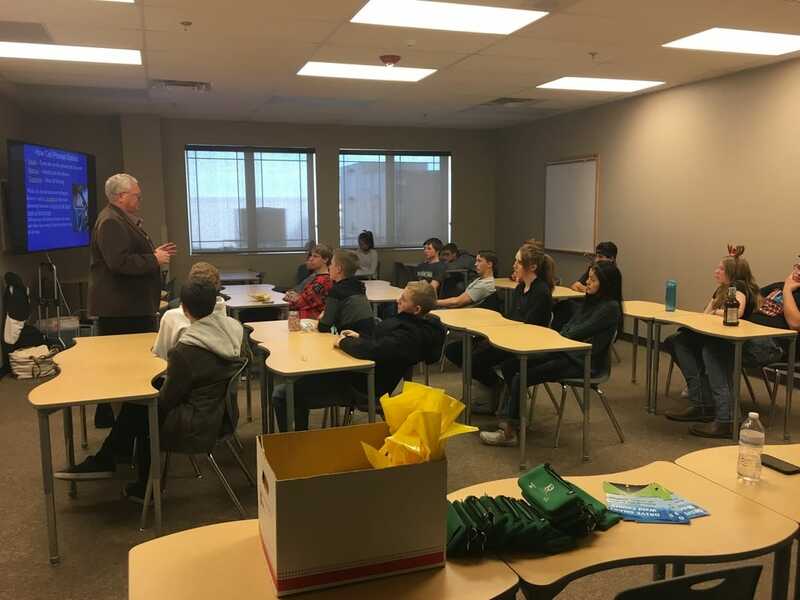 Professional Driver Scott Murray spoke to the Greeley West AVID group about safe driving around big rigs in preparation for their Truck Smart event February 7 sponsored by DRIVE SMART WC and Colorado Motor Carriers Association. 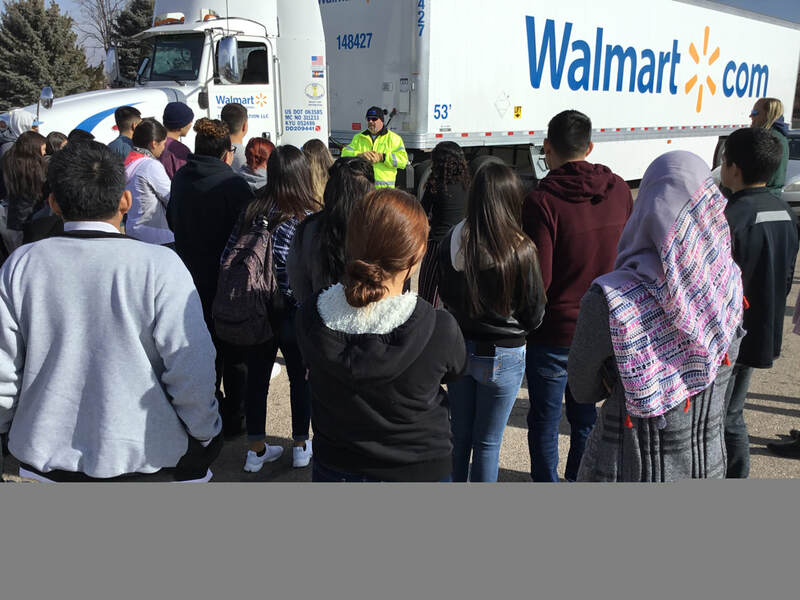 A big rig provided by Walmart will park at the school and provide the opportunity for students to climb in and experience the No Zones and get a feel for just how big a big rig is! Education will be provided about No Zones, stopping distances, and turning radius. 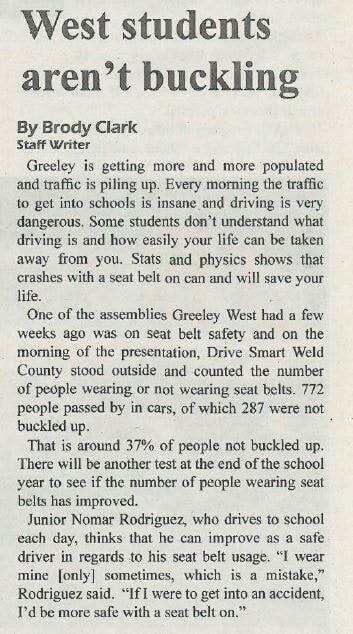 Students will be writing an article in the WestWord and having daily all school announcements about how to drive safe around a big rig. ​Roll ups - Drive safe, don't roll your car! Smarties - Be smart, buckle up! Cupcakes - it's a piece of cake to buckle up! 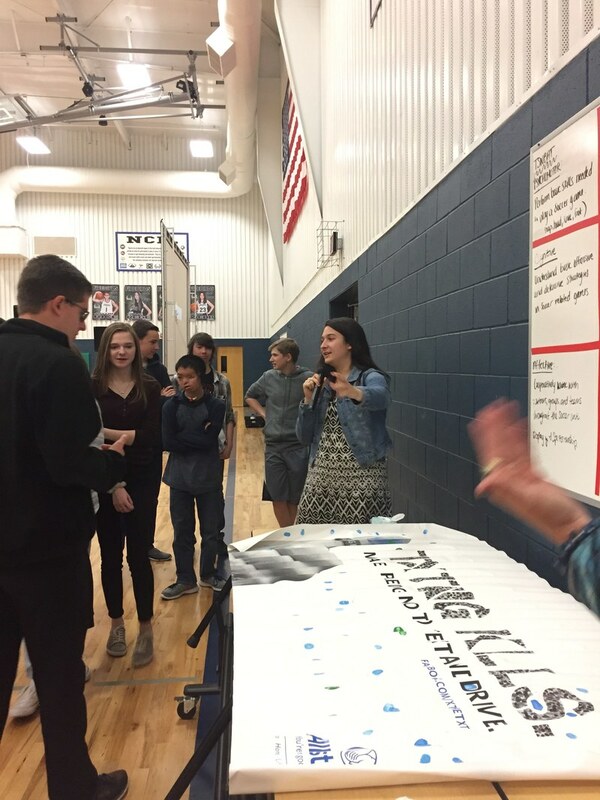 Fort Lupton High School sponsored a Drive Safe Week which included designing a safe driving poster, a week of all school safe driving announcements, and hosting the ThinkFast program. Wear seat belts at all times-EVERYONE in the car. Please do all you can to drive safely and carefully. Drive smart Fort Lupton. 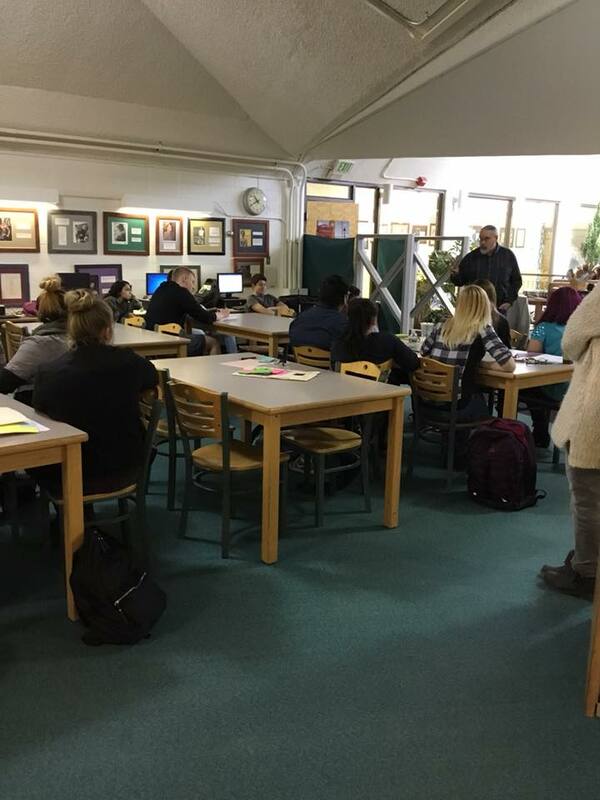 Students participate in the ThinkFast program November 30. Memphis Baker making an all school announcement. 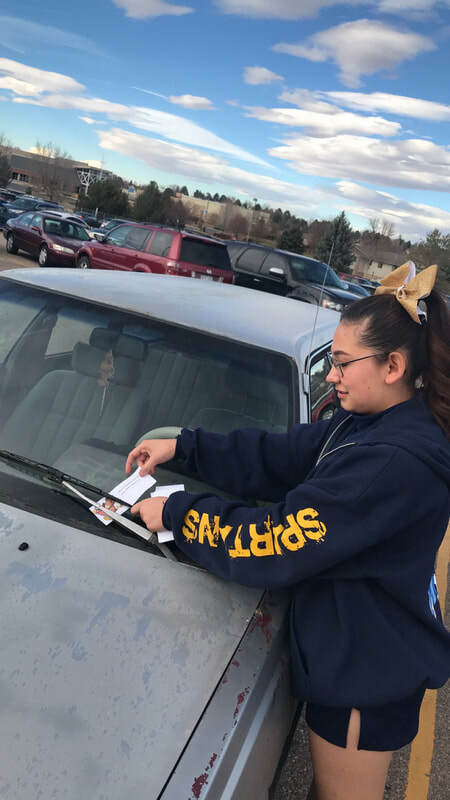 The Greeley West AVID group had all school announcements to encourage students to drive safely using some of the information they researched. Traffic fatalities have risen by 24 percent since 2014. Colorado is growing, but that doesn't mean traffic fatalities must grow too. There were 17,854 seatbelt violations in 2017 in the state of Colorado. Make sure you are driving distraction free. In case someone else isn’t. In Colorado you are 13 percent more likely to die from a car crash if your dog is in the car. Keep your pets home or secured in the car. There are 26,000 reports of drunk driving in Colorado every year. Be Smart, don’ drive drunk. Last year 605 people died on Colorado roadways. Most were suspected of being caused by alcohol l and drugs. Don’t be stupid. Be sober. 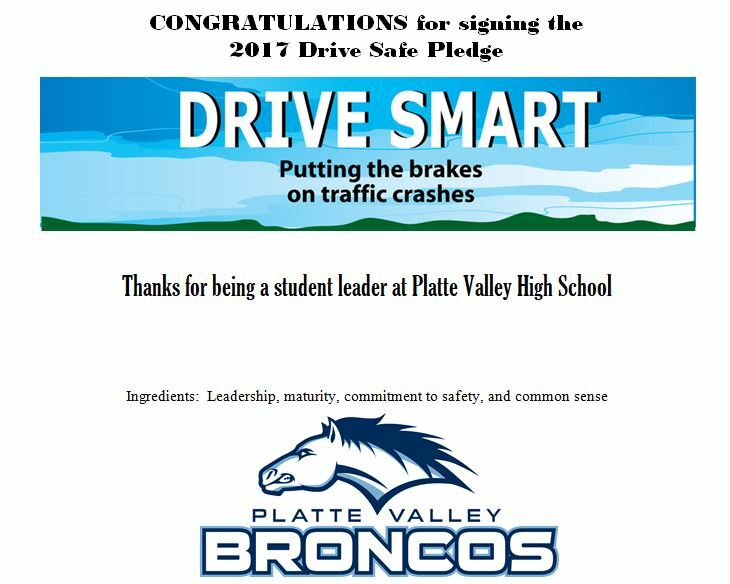 Platte Valley High School hosted the DRIVE SMART Teen program for 87 freshman. 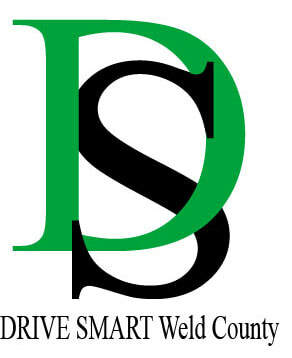 This interactive program is offered free of charge by DRIVE SMART Weld County. 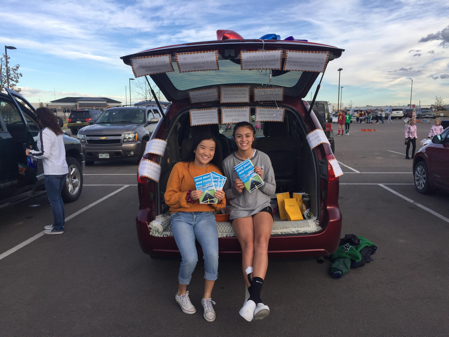 PVHS FCCLA had a homecoming pledge drive asking students to avoid distractions, alcohol, and drugs, as well as buckle up during the homecoming weekend and beyond. 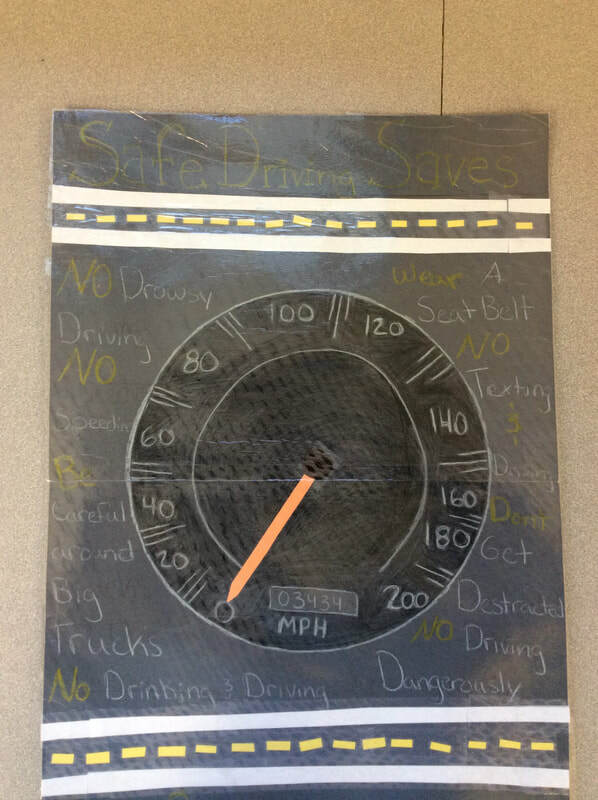 Greeley West AVID group created posters for the hallways to increase driving safety awareness. October 2017 Greeley West Avid group show off their posters. 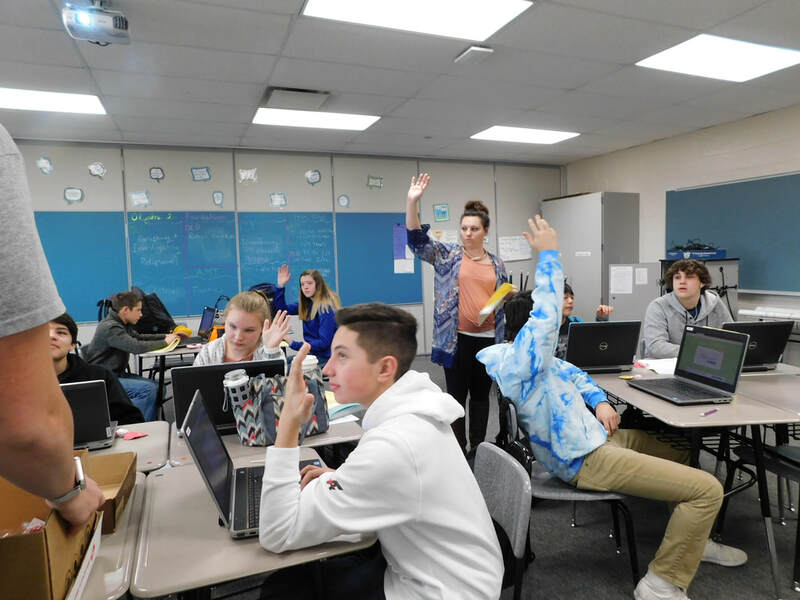 The Greeley West Avid group had a very good article in the West Word written by Brody Clark. We are excited to announce the award winners of our Buckle Up Drive Smart campaign for the 2016/17 school year! Congratulations to Sara Chandler and Windsor Charter Academy! Sara's Buckle Up Drive Smart projects earned the school $500! Sara organized a Safe Driving event this spring and organized her peers to participate and create a video. 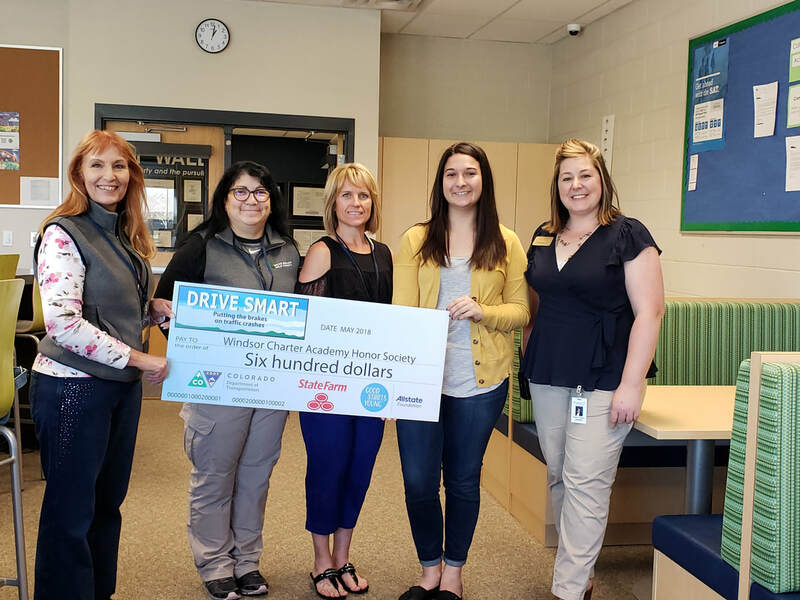 Platte Valley FCCLA was awarded $550 for their Buckle Up Drive Smart activities over the year! This is the second year PVHS has participated. They submitted a winning video and had a very creative pre-prom safety campaign along with several other activities over the school year. Sponsoring teacher Janet Niederkorn posed with students and DRIVE SMART Weld County representative Marjorie Hanson at the celebration party. 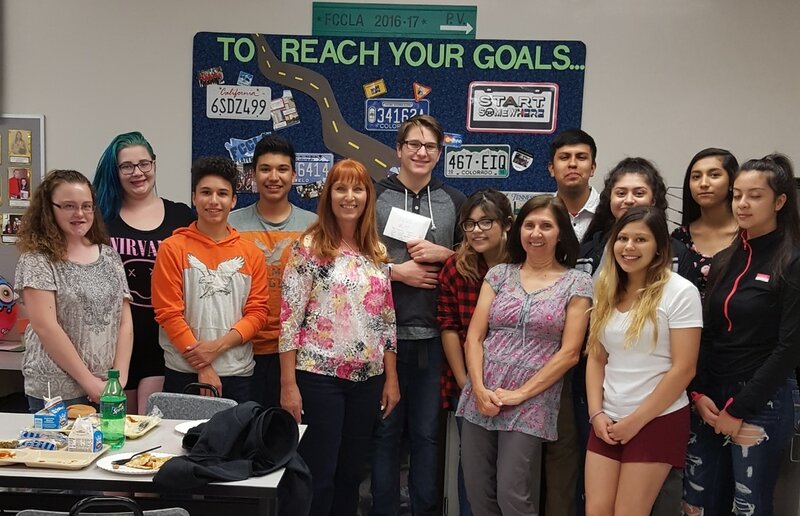 ​Prairie High School FBLA was awarded $600 for their Buckle Up Drive Smart activities over the 2016/2017 school year which included presenting driving safety issues to every grade! Sponsoring teacher Kyle Coles posed with students at their celebration pizza party. 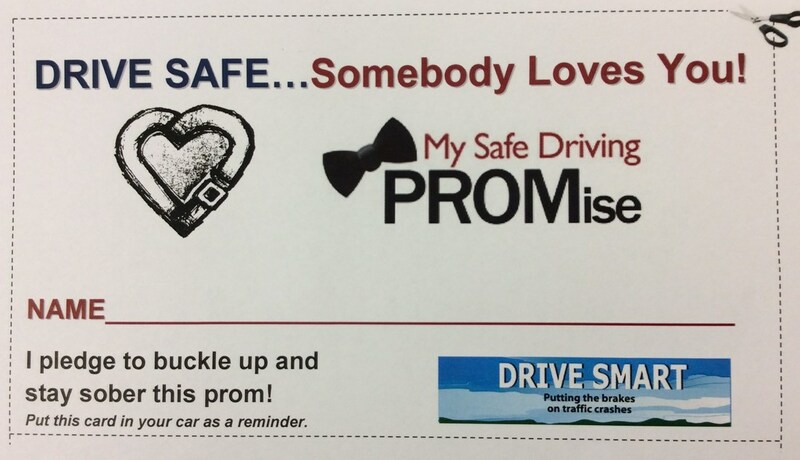 Platte Valley High School FCCLA organized a pre-prom safe driving campaign. Every student driving to prom is invited to sign the pledge below. Yellow ribbons will be tied on each antenna in the parking lot along with an all school announcement reminding students about the pledge. 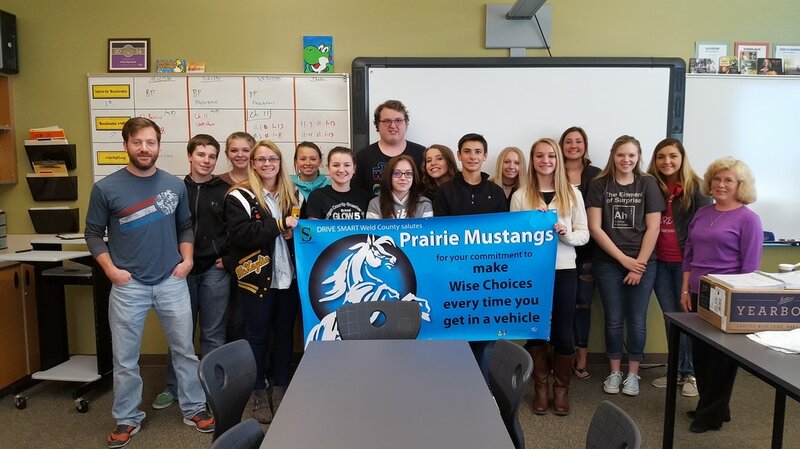 Prairie High school FBLA students divided into pairs and each presented to a class room k-12. Members created a slide show based on the grade level. Younger grades were taught about car seats and distractions while older groups were informed on distractions and texting. Both groups were taught the importance of buckling up. 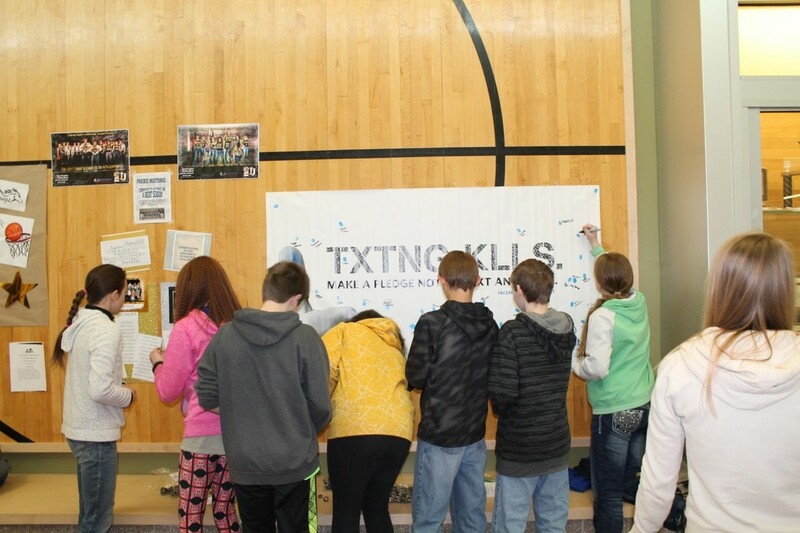 ​After the presentation, grades 8 - 12 were invited to pledge not to text and drive. Windsor Charter Academy Safe Driving video submission created by students. 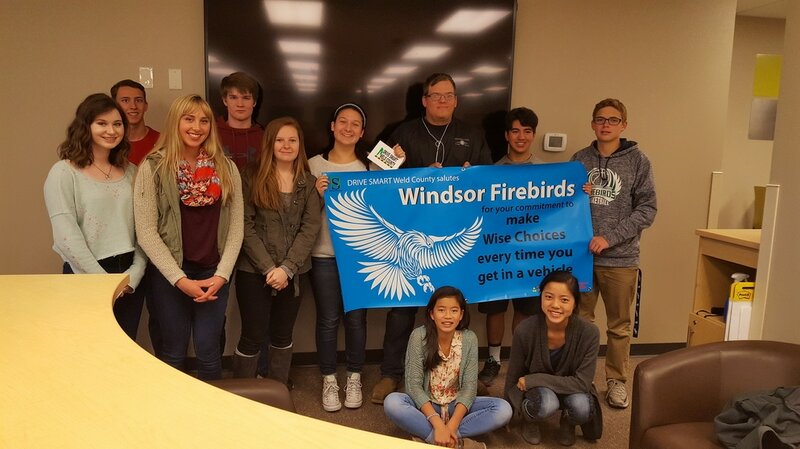 Windsor Charter Academy hosted a Drive Safe event as part of their BUDS activities. Planned by Sara Chandler, the sponsoring student, there were survivor speakers, crash cars, distraction games, fatal vision goggles and distracted driving pledges. 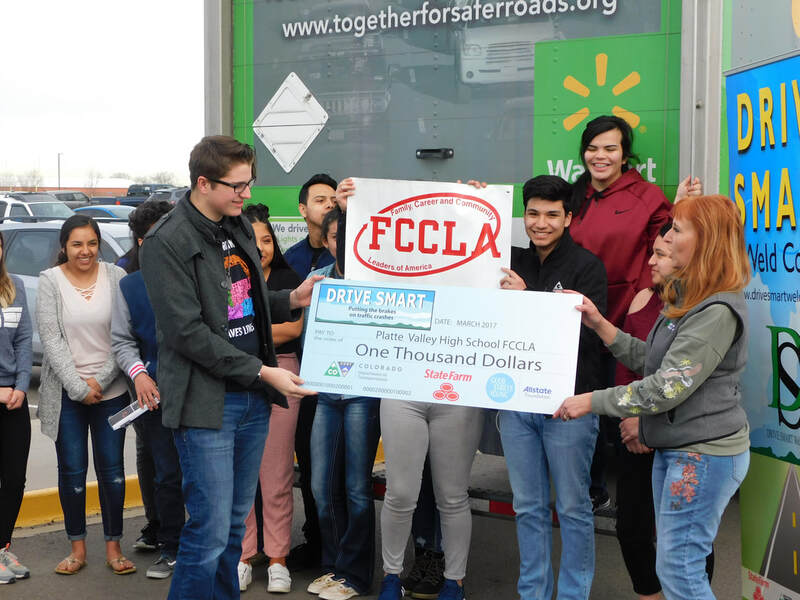 Thanks to our partners, Superior Towing, Anshor Driving School, Weld County Health Department, Allstate, State Farm, CDOT, and survivors Luis and Brady for making this a success. 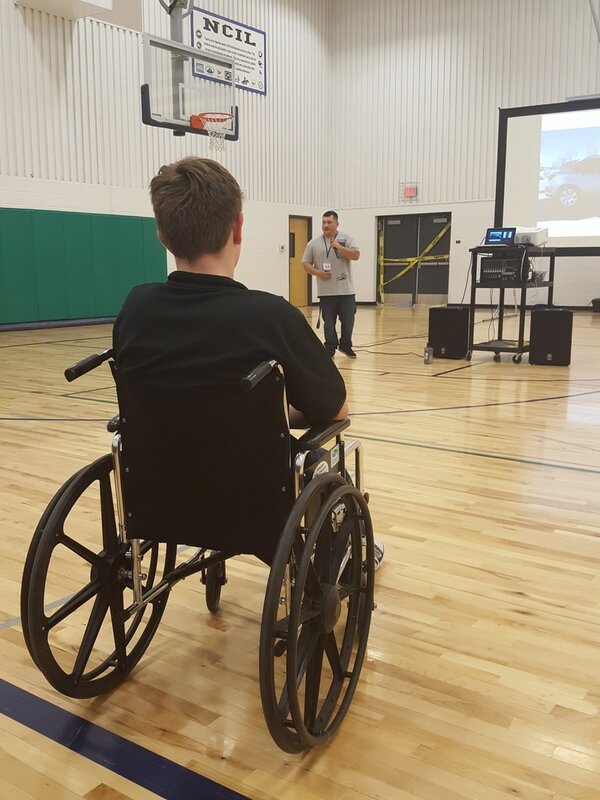 A WCA Student takes a seat in a wheelchair while survivor Luis Cerenil talks about the results of his distracted driving crash. 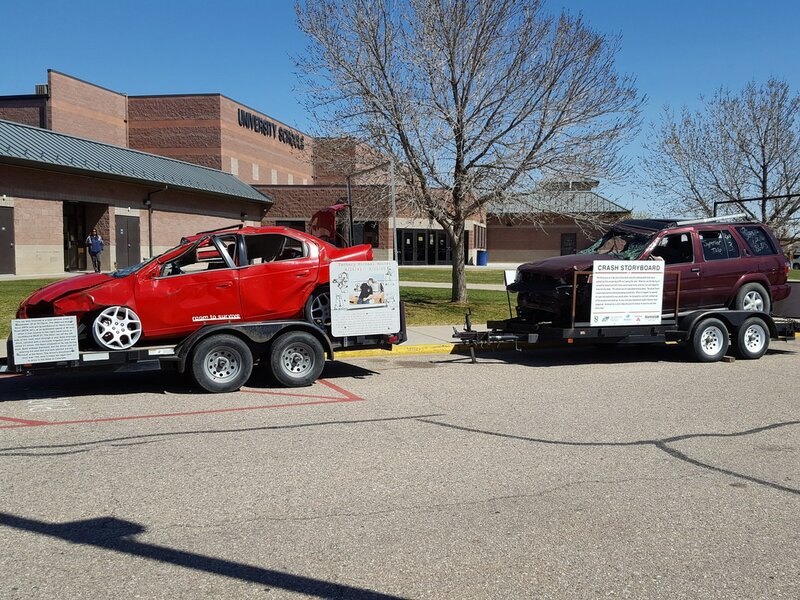 Two DSWC crash cars are being used for pre-prom safety awareness. BUDS participant Madisyn, will be having the driver of one of the vehicles speak at the school. February 15. 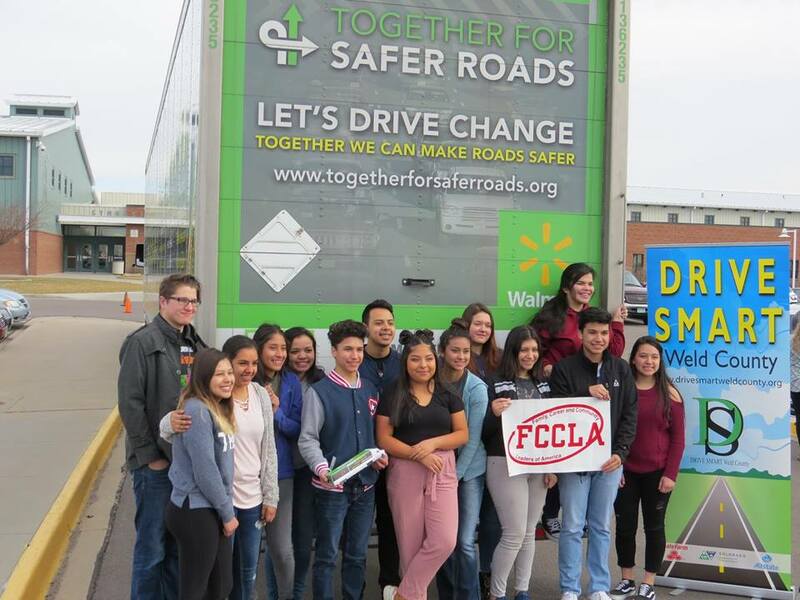 2017 Platte Valley High School FCCLA from Kersey, CO created this mannequin challenge video as their 2016/2017 Buckle Up Drive Smart Video Challenge. 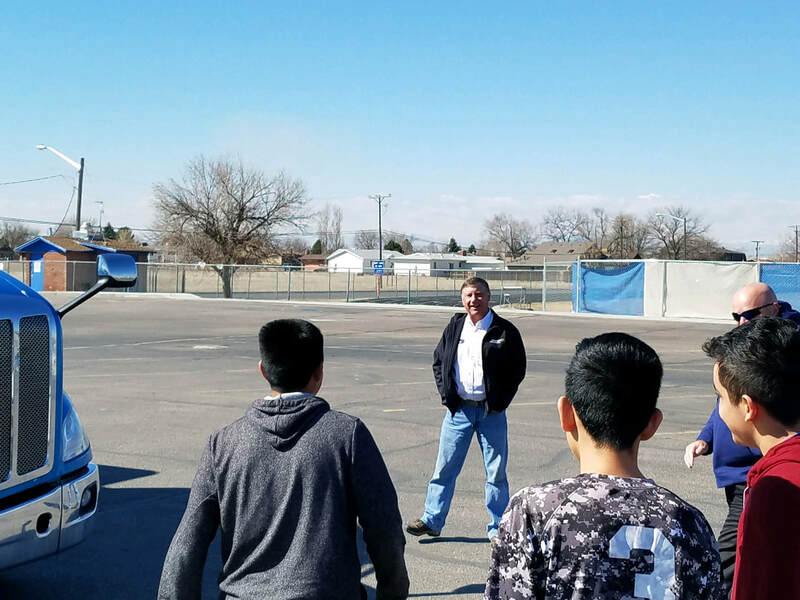 ​DRIVE SMART Weld County with the help of coalition member Steve Duus (recently retired Greeley PD), taught three safe driving Classes at Windsor Charter Academy's Safety Day. We were happy to be a part of such a great event! 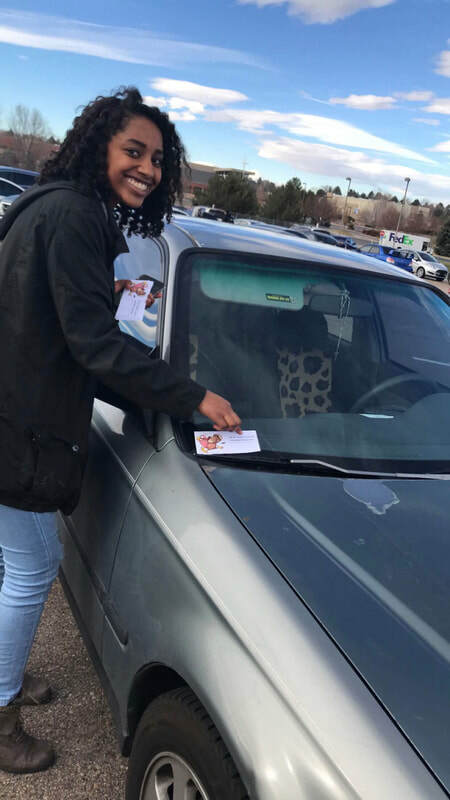 University High students braved the cold to complete their seat belt observation! Windsor Charter students conduct their Buckle Up Drive Smart seat belt observation.